I was not really planning to do another "Cooking School" session so soon, but as things would have it, this is the ideal post for my own event the Monthly Mingle. The theme this month is Holiday Cuisine. You folks probably thought I would be cooking up something Greek to celebrate our upcoming vacation. Nope! It is the perfect Paella. You all want the story now, right? 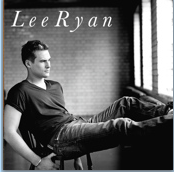 Well it is a romantic one and if there are any sentimental ones out there (like myself) a few tissues would be handy. Tom and I will be celebrating our 8 years together on September 9. We came together 8 years ago and have been going strong ever since. We've done and seen so much together that sometimes it seems like we've been together a lot longer. We both love traveling and have been to a few great places. One place that I will always have in my memory is our very first vacation together. It was on the beautiful island of Mallorca in Spain. To be quite honest, we wanted to go to Greece (sound familiar) but had decided on the vacation spontaneously and on the last minute. We found nothing that fit our schedule. Finally our travel agent recommended Mallorca. We were very hesitant because Mallorca does not always have the best of reputations. What you see on the travel reports and often hear are the stories of the beach mile in Palma where everyone gets drunk and parties wildly into the wee hours of the morning. Hey, we like to party too, but it is not really our type of vacation to spend the days nursing a hangover and the nights in smoky bars. The travel agent was brilliant. She put together a fantastic package and said that she would book us in a romantic hotel about 30 to 40 kms from Palma. We decided to rent a car and the agent gave us a few fantastic tips. Mallorca is a beautiful place with lush green vegetation and an aquamarine sea. We stayed away from Palma for the most part and set out on our own tours discovering the East coast of the island. Romantic bays, sandy beaches, gorgeous sunsets and the food was to die for. We ate in rustical restaurants serving some of the most delicious seafood specialties I have ever had and of course my all time favorite - Paella. It was in Valldemossa where Tom and I actually really fell in love. There is always that one second when you look into someone's eyes and POW! you know you've been hit by cupid's arrow. For us it was in this quaint and charming little town and funny enough right there in the monastery where Frederic Chopin spent the last years of his life. Valldemossa is famous thanks to Chopin and his lover, writer George Sand (wrote "A Winter in Majorca") who moved there to fight against Chopin's tuberculosis. The village is situated in the mountains and getting there from the coastal harbor is the most amazing drive. Through luscious olive and almond trees, always with the view of the turquoise colored sea below. The winding road up to the town was so breath taking that we kept stopping and taking pictures. Once there, we wandered the town, including the monastery's gardens. Sitting in the courtyard just outside the monastery gardens we both wrote postcards to our friends. There on that bench it clicked. Just like that. I looked at him writing his cards and smiled, in that moment he looked at me and smiled back. My stomach did a huge turn and everything went pink. Isn't that the color of love? After this enlightening moment, we walked around and found a gorgeous little restaurant. On their board outside the words "Homemade Paella" brought water to our mouths. It was the best Paella I have ever had. Probably because the atmosphere surrounding it was so grand. Ever since then I have been trying to make the perfect Paella. Some resulted in disasters others were very good, but always a lot of hard work and not quite that Valledemossa taste. I did not give up. Experimenting and tweaking all the time. Eight years after that Paella I think I am ready to serve you what I believe to be that very perfect Paella from Valldemossa. 500 g Mussels - washed and cleaned. Sort out those that are opened. 150 g large shrimps or prawns - cleaned. You can leave the skin on if you wish. Photo on Explore: September 4, 2006. View my entire Explore Photostream. To start with you will need a large heavy pan with a lid that you can put into the oven. I used my Wok, which served the purpose very well. In some oil fry the chicken on both sides until golden brown. Take out and set aside. Heat up some more oil and add the fish, mussels, and the shrimps. Quickly saute these for approx. 2 to 3 minutes. Salt and pepper to taste. Take out and set aside. Pre-heat the oven to 150° C.
Adding some more oil (should you still have some oil in the pan then you do not need to add any more) saute the peppers and the onions. Add the garlic and the rice and mix together. Dissolve the saffron in the chicken stock (if you should accidentally spill the contents of the saffron on the kitchen floor like I did and there is no more saffron in the spice cabinet - please substitute with turmeric. LOL!). Add some of the chicken stock/saffron (turmeric) mixture and the peas. Allow to simmer for a few minutes until the liquid has been soaked up by the rice. Then add some more stock. Repeat this process until all but the last 1/4 l of the liquid remains. Add this to the rice. Salt to taste and now add the mussels, fish, shrimps and the chicken to the wok. Mix well. Cover and put into the oven to allow the paella to cook slowly and soak up the remaining liquid - about 20 minutes. 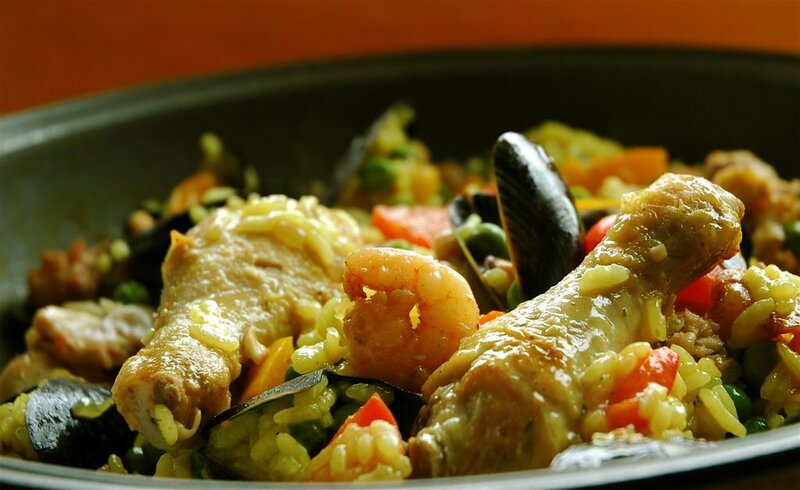 Do not open the lid too often as the paella needs to gently combine all its flavors and aromas together. Take out of the oven. Keep covered for 5 to 8 minutes before opening. Salt and pepper to taste and pour the lemon juice over the top. Enjoy with a chilled white wine on pre-heated plates. I can't even start to describe the reverie of flavors and aromas. Once you open the lid you are hit with ecstatic fragrance of sea and land. Do you know what I mean? The seafood brings that aroma of the ocean and the rice, vegetables and chicken takes you away back on the mountain village of Valldemossa. Fork after forkful, it was a delightful experience. 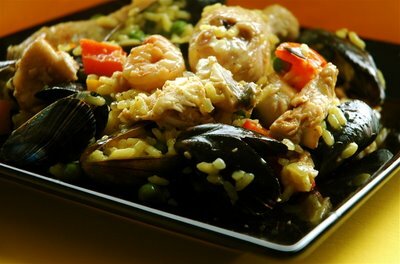 The chicken and the shrimps, mussels brought a gorgeous harmony to the rice and vegetables. Soeren at first did not want to eat the mussels. "You can't eat shells!" But as I scooped out the flesh and showed him that it was this part he ate, he was willing to try. Yes, he ate the whole plate, even the mussels and wanted more. So, any parents with kids who might think their kids will not take a liking to this do not have to worry. Tom, looking at his expression, was back in Mallorca. He seemed to be in a trance and enjoyed every biteful. I had made a huge amount of the Paella. I was really surprised that a larger part of it disappeared. Last reminder that the deadline for this month's Monthly Mingle Holiday Cuisine ends on September 7th. So, get those lovely dishes sizzling that take you away to that far off land or remind you of your fave holiday. Ruth from Once upon a Feast is hosting the Weekend Cookbook Challenge this time round. She has chosen the theme (somewhat similar to the Monthly Mingle) "Foreign Dish". I figured this would be a perfect entry for the event. This recipe has evolved from several different cookbooks, magazines and hand-me down recipes from some of my Spanish friends and so I am unable to define one particular cookbook for it. I hope Cate will also enjoy this dish for her ARF-5-A Day Tuesday. Lovely story and one of my favorite dishes. The first time I had it was on a vacation to Madrid a million years ago. Every time I see a picture, or better yet, taste some I think back to that time. Thanks for the memory and for sharing with WCC. The roundup should be up later today. Ooh so cute your story. I think holidays are a perfect way to "test" the relation as you are stuck 24/24 hours with each other. Wishing you many more happy years together. Lovely story. Thanks for sharing it with us Meeta. Would love to know how you and Tom met. Another story, another recipe probably, eh? 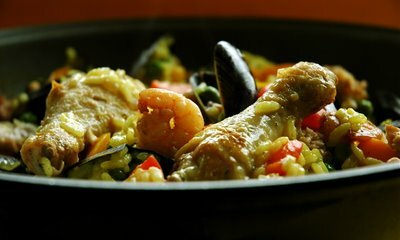 My dream is to make a beautiful paella like this! You should really open up a cooking school. Beautiful story and beautiful dish. Meeta thank you for joining WCC this month. This was a lovely story, Meeta. I'm with Ivonne - open up a cooking school!! This is grand! I have always wanted to make paella. Texas never seems to have the right seafood for this. Wonderul writing, thanks for the story. And yes there is that moment that you know. Your write up about your trip and Tom brought back memories and reality too! I met Arvind when I was 17 just about to start college and Arvind was 19, just had entered Medical school in India. Got 2 wonderful kids too! YAY!! I love this post! Such a wonderful story and such beautiful pictures. You did justice to this lovely dish. The only one who ever makes paella in our home is my dod, and he likes to do it outdoors on a coal grill. Someday I hope I'm brave enough to try making it on my own. :) Thank you for sharing this with us. that's a lovely story...I experienced something very similar during my honeymoon...and bam! I knew he was meant for me and I, for him. Your post is beautifully written and may your love for each other last forever and ever. Congratulations on your upcoming anniversary! How lovely to see love between two souls continue to grow in strength. Time only nurtures and allows the hearts to blend which brings a gift like Soeren into your lives. When in Spain, Paella is a dish one cannot miss. Paella Valenciana is a traditional family dish prepared during the holidays. Along with my Mom's "Arroz Caldo", Auntie Anni's Paella is always requested. I have a collection of various sized paelleras, from a cute serving for one to an XL for 20. I've yet to prepare the dish in its original "outdoor" environment. I'm inspired to make this for the weekend. Our red bell peppers are coming to their crimson glory, so I'll include them in. Thank you all for your kind words. You are pretty awesome. Would you have a veggie version of the Paella... wanted to try that... am not much of a seafood fan!Or if itake out the sea food and just keep the chicken in, will it taste good?? Hi Simran, Sure you can make this entirely vegetarian. Use anything you like. I preferably like using whole button mushrooms as they add a lovely flavor to the dish. This is a pretty versatile dish so you can really use whatever you like! Hi Meeta, lovely blog. I've been browsing through your blog and your recibpes and photos are great. However, being Spanish and having been cooking paellas for about 15 years, I must make a couple of points about your paella recipe: In Spain we never use yellow peppers. We grow them, export them, and that's it. Well, we sometimes use them to make foreign recipes...We use green and red peppers though. Also, we never put pepper (as in salt and pepper) in paella. It neither goes in the oven: it is cooked over the fire and with no lid on the pan, 10 minutes on a strong fire and 10 more on a low fire; then, when it's out of the fire, it is covered with a clean cloth or a newspaper for another 3-5 minutes (checking that the rice does not get too soft). If you want the perfect "point" for your rice on this timing (10+10+5), the formula is: 2 cups of water for every cup of rice. About the vegetarian paella you suggest, it does not go very well with mashrooms, I've never seen it done in my country, try with peas, green beans, broad beans and artichokes. By the way, paella is the pan we use to cook the rice (like a wok is a wok), but any low pan should do well. I hope you enjoy your paella. Hey Berta, Thanks so much for your input. It really is valuable to me and my readers. I never knew that yellow peppers were never used in Spain, especially since the paella we had in Mallorca had yellow peppers in it! About the open fire - well I knew that but at home I do not have the possibility to cook on an open fire as it would be traditionally done. I presume that many of my readers also would not have that possibility so I recommended the oven to get a similar effect. Suggesting mushrooms was something I did out of experience as when my mother made her paella she added mushrooms and we found it quite nice. But of course all your suggestions sound simply great too. I do appreciate all your tips and points - hope it helps all my readers making a perfect paella! Julia Child has a wonderful Paella recipe that you cook in an electric wok! My wife and I have enjoyed it with friends many a time, with variations and embellishments. Please allow your creativity.